John Lewis refers to it as 'edited choice': a curated sub-selection of products, presented to customers in a way that delights. There are tens of thousands of books published every month, a figure rising rapidly in the digital arena, and the ability to offer expertise and appropriate recommendations, to attenuate the more 'enthusiastic' blurbs and to momentarily tune out the clamoring of desperate online marketing is becoming ever more critical. It seems that the independent booksellers who are surviving and even thriving do this better than anyone else - and it's certainly what we aspire to (however, note to self: "must do better in 2012"). Strip out the events, blog posts and tweets, and underneath it all is a passion for "bringing you only the best" (as booksellers Magrudy's would say). This sets a very high bar. You get close to the nerve-shredding world of the restaurateur, where one duffer meal means you'll never see a customer again. But possibly the worst feeling is that you have 'missed' a book. Suddenly everyone is talking about it, and you didn't see it coming. Because it's impossible to read everything that is published, you get to rely on your bookselling 'intelligence network'. We have a superb one, which sits on the shoulders of publishers, reps, reviewers, other booksellers - and ultimately customers. One of the many and best privileges of running a bookshop is the sheer number of people you get to talk to about books and authors. Over time, you begin to develop an intuitive feel of 'the best of the best' - and author Colin Thubron definitely sits in that category. 'To A Mountain In Tibet' came out last year in hardback, and I meant to get around to reading it (along with the hundred or so other books that fit into that category). The intelligence network was giving out plenty of strong signals (not least bookseller Patrick Neale who flagged it as one of his books of the year). I finally read it just before Christmas, and it's a book that has got under my skin in a totally unexpected way. In one way, this book is easy to describe: one of the great travel writers makes the pilgrimage to Mount Kailas, possibly the most sacred mountains on Earth. But the book is such an intensely personal account of the journey, that at times you feel Colin wrote it with no readership in mind. The elements that he weaves together - the punishing and at times brutal nature of the pilgrimage, the despair and poverty of the people he meets, the legacy of Chinese rule, are grimly painted on with broad brush strokes, and the central story never wavers too far from the author's own experience. This works brilliantly, and places you right there on the scree paths, at times gasping for air as the path climbs ever higher. Mount Kailas is sacred to one-fifth of the world's population, and is believed to be the residence of Lord Shiva. It has never been climbed. Thousands of people make the pilgrimage every year, circumambulating the mountain clockwise or anti-clockwise depending on thousand year-old traditions of the four religions. The pilgrimage starts with plenty of descriptions of Nepal, anxiety of crossing into Tibet, the poverty and reality of the people that Colin meets and spends time with. His writing style - familiar to his other books - is one of particular empathy with the people that he meets, and divining the family situations of the houses he stays in allows Colin to give a snapshot of the day-to-day reality of life in both countries. As the book progresses however, the writing – like the air through which he ascends – becomes more rarified, and themes become much more finely honed. At one point he draws attention to the physical price he’s paying as he ascends into thinner air (Thubron is over 70). Old injuries are remembered, nagging at him like old adveriseries, but we slowly become aware of a more profound incident from his younger days. This personal tragedy - of which we learn only the merest of details - is resolved, in a manner of speaking, a few pages from the end of the book, in just a handful of sentences. It’s possibly one of the most moving things I’ve ever read, and with great skill and absolute respect he manages to weave this into the mythology and significance of where he is and the journey he is taking. It's tempting to believe Thubron had a profound spiritual experience at the height of the ‘prama’, but if he did, it was a very British one, in keeping with his character, but nonetheless as touching and moving as if he had been prostrating himself at intervals as other pilgrims do. Colin keeps the writing at a dizzying quality throughout, and the descriptions of landscape, religions, history and individuals demands effort, but conjures up lucidly this moonscape at 18,000ft. The area around Mount Kailas does indeed feel like you are on another planet. Peppered throughout is matter-of-fact descriptions of the consequences of Chinese actions over the 50 years of occupation. The destruction of holy sites during the Cultural Revolution dwarfs anything the Taliban did in Afghanistan. The book ends abruptly. He turns for home with the other pilgrims, changed. As will you. It's a book that you will read in an afternoon, but if you're receptive, it will stay with you for a long, long time. 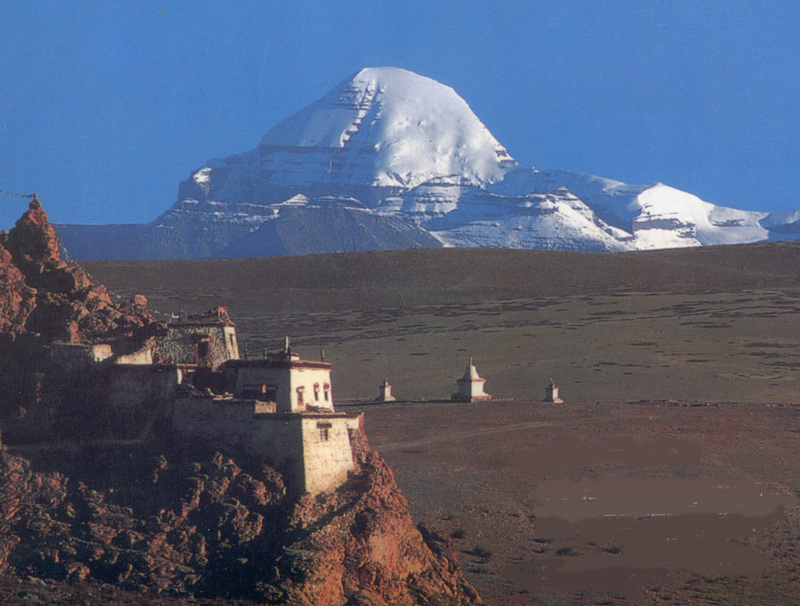 Buy 'To A Mountain In Tibet' securely from Mostly Books now, post-free in the UK.